The seasons on Mars and Earth are anti-correlated at present: days are getting shorter and shadows are getting longer as autumn ends and the beginning of winter draws nearer in the martian southern hemisphere, just as the same is occurring in Earth's northern hemisphere. 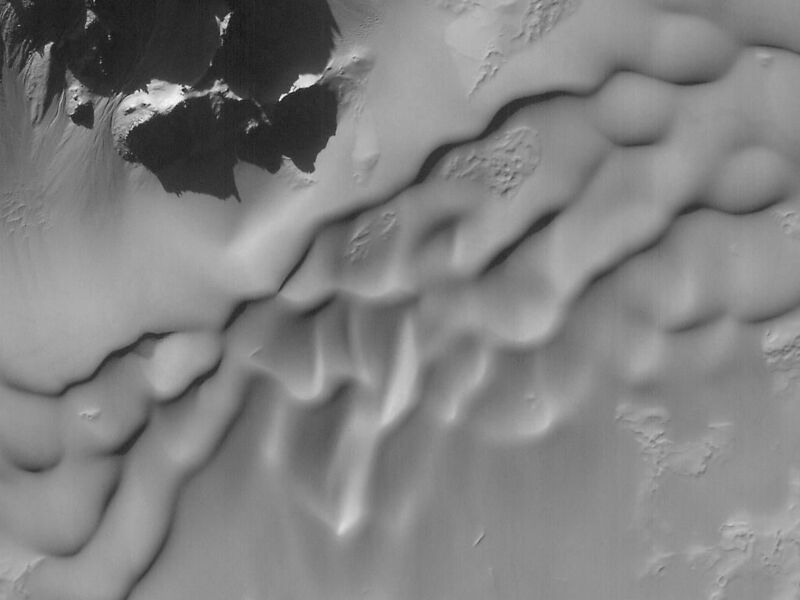 Long shadows are especially prominent in this high resolution view of mountains forming part of the central peaks of Hale Crater (left), a 136 kilometer-(85 mile)-diameter impact crater at 36°S, 37°W. 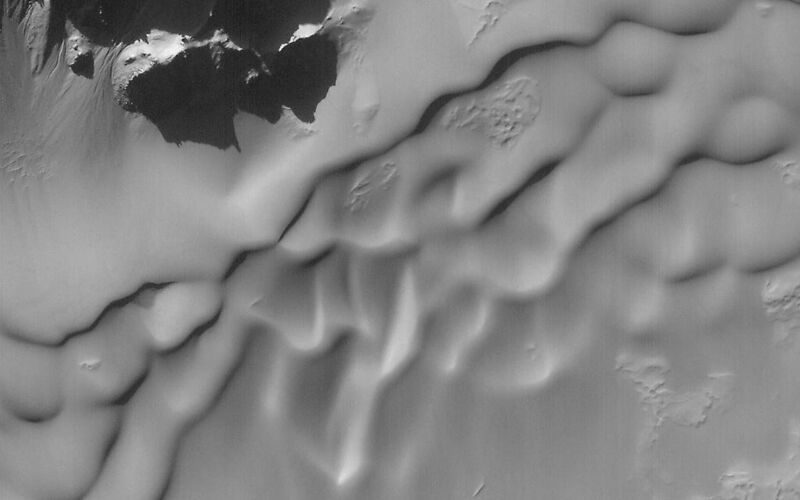 The two pictures were taken simultaneously by the Mars Global Surveyor Mars Orbiter Camera on November 10, 2000. The sun illuminates the scene from the northwest (upper left) about 22° above the horizon. Knowing the sun angle and the length of the longest shadow (~1.6 km; ~1.0 mi), the height of the largest peak in the high resolution view (right) is about 630 meters (~2,070 ft) above the crater floor. 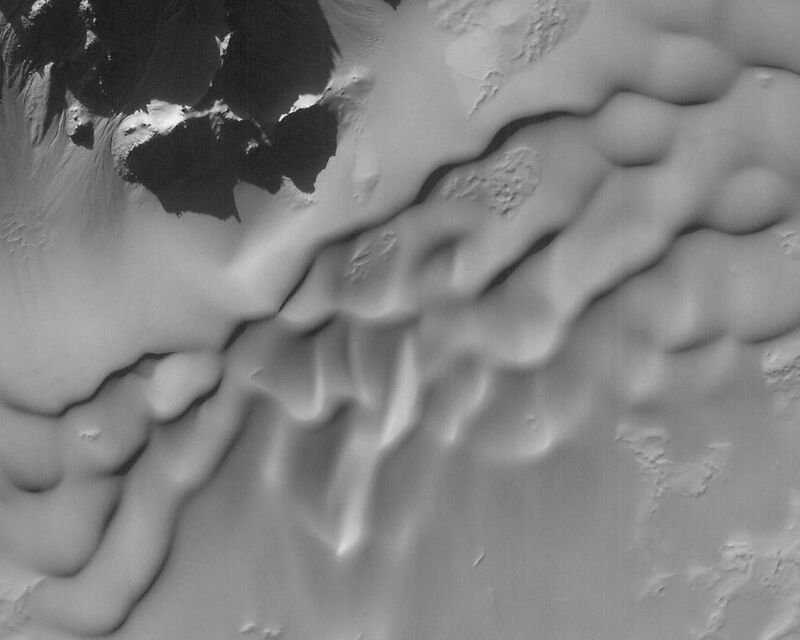 Sand dunes blanket the middle portion of the high resolution view, and small gullies--possibly carved by water--can be seen on the slopes of some of the peaks at the upper left. Winter in the southern hemisphere will begin in mid-December 2000. The high resolution view covers an area 3 km (1.9 mi) wide at a full-resolution scale of 3 meters (9.8 ft) per pixel.